Having Zara around is fun, but it also means the house can never be tidy, every where she ‘sweeps’ through, either a small mess or a big mess is created. Daddy and I sometimes call her Hurricane Zara. The worst hit area is the living room, where she has her 3 boxes of toys, a small shelf of books, her box of CD/VCD/DVDs, her box of colouring and drawing stationary. Depending on her fancy, she helps herself with whatever she wants to do for the moment. Then going to her shelf of books, digs for the one she wants, in the mean time scattering the rest on the floor. A moment later, she goes back to her box of toys, takes out her cooking set, and starts to do cooking. A big messy trail is left behind, all within 30mins. When we bring her up to the room, the same process happens, but b’cos she has less toys up stairs, all she gets to mess up is her stack of books. How can I do without a maid? With Hurricane Zara sweeping through the house so often? Haha, I was just as bad when I was a toddler! I remember clearly now… Everything is flashing before my eyes. Yeah, make her clean up and she will learn not to mess up. I don’t have a maid, therefore my children have to clean up their own toys. My hubby and I cannot stand our house being untidy. A game you can try with Zara, it is called who is the fastest in putting all the toys into the box. Winner gets her favourite snack. Yeah, with kids, the house will never be the same! I used to make Gavin keep his first set of toys before he move on to the next set. If I’m playing with him, I’ll try to keep the place tidy or the maid will do it if she’s with him. But honestly, it can get too tiring going after the trails. These days, I just leave it to the maid to tidy up. I’m glad my two hurricanes can clean up now. Though it may take a little lightning to get them moving. Yeah yeah, the memory is coming back….. trail of destruction following my boy back then. lol I used to step on Lego parts all the time. Hmm, those were the days. Now, it’s CDs, VCDs cover. Chloe is this way too.. but she has learnt to pick after herself.. and we try not to do it for her.. so she knows. Got “angmoh” slang lah.. because my “angmoh” ang also say so.. kekkekee!! Same as my house. Every where is their toys, even in the bathroom or daddy car. Sometime very tired to clean their mess, i just let the toys there cause tomorow they will play again..hehe..lazy mummy. Haha, Hurricane Zara is so appropriate! I have 3 hurricanes at home, that occur around the same time.. now, one more is on the way…. My DH advise: keep less toys for her to play. Others keep in store room! After play, must keep the toys back to original “home”! Else he’ll threw (keep) away all the toys! It works but need time though. My girl loves to pour all the Lego out of the box to make a mess. Now, that really gets on my nerve! I usually make my kids keep their own toys after playing as need to inculcate a sense of responsibility in them. However, if I am in good mood, then I’ll keep for them. I make Jeriel clean up his toys at the end with of course we helping him because no maid to help.. Same as Gordon lah. I have all his toys stashed in a cupboard. He knows where to get them from but dont wanna keep them after play. Sometimes i have to keep myself from tripping over the smaller ones. But, he prefers to play with the boxes the toys came in rather than the actual thing itself. So, next time, when u buy toys for ur gal, i want the box, lol. Never mind. Zara got Super Woman ZMM to sort things out! The big items are ok.. it’s the small items that she finds it hard to ‘clean up’. I’m teaching her to put back her soft toys, and her books to where they belong, but I still have to do the finishing touches. Now you are such a neat and tidy person, do you still want a little hurricane to mess up your place? I’m making her put back bigger items, but she has probably doing the small ones esp the glass pebbles. I sing the Barney “Clean Up” song with her, and she’ll walk around trying to clean up. See with girls, they like to play masak masak, and they are all in tiny pieces. When she pours it out, the whole place is a mess. Tough for little hands to clean up too. But she’s doing that with bigger items like her key board or her talking doll. Tired huh? Cleaning after them? Haha.. Daddy or mummy who will strike the lightning? You mean little hurricanes never grow up? Something for me to look forward to huh? That’s nice, even toys with small parts? Haha.. her Angmoh slang is probably from all the TV. You have 3, I know, it’ll be even tougher. I heard it’s good to have a toy room, let them mess up there, no eyes see. Wah, you hor really know how to ‘comfort’ me.. but I hope the water will really come la. Unless you train her from young to put things back.. which I’m still trying.. Still trying to train her how to clean up. Haha.. if I have to depend on my husband hor, the whole house will be a garbage dump. Haha.. yeah. I think they like the ‘pouring’ and the sound made by tiny items hitting the floor. I think you can train Wien, but Lyon still too young to be trained la. I need to find a place to be turned into her toy room also.. then separate different toys into different boxes.. hmm.. wonder when can achieve that. Yeah.. I’m trying to teach her, but I guess it’ll take some time. That’s nice, and Jeriel cooperate? Hey, when Zara was younger, she likes the boxes too. Nowadays, if it’s a big box she likes, because she can sit on it and pretend to be a boat. But smaller boxes, she will bring it to the rubbish bin to throw it. You are going to have Malcom.. aaah.. double the mess. Some thing for me to look after too. So, still want to have kids? I think they like that sound a lot huh? That’s why prefer to pour than take out one item at a time. Wah.. luckily Izac immune to the noise. Hehe…My maid will always tell “Kapal Pecah” if Keith messed up the whole room. Oh no… hopefully this is not common. I gave up to clean after them, so my house forever toys, I only idy it up when there are guests coming over. teach them to pick up their toys is good, but i have no patient to wait for them to do it *rolleye*. This is what happens when parents pile toy after toy on the kid. Maybe consider buy less toys? Then again, kids today are so lucky. I don’t remember myself having so many toys. I only have one toy, the TV! Haha.. but it’s appropriate right? Aaaah.. I thought normally mummies are the ones who carry the bolts. Kapal Pecah?? Haha.. Indonesian anology ah? Common for houses with small kids yes. Yeah loh.. after a while, you get immune to it. 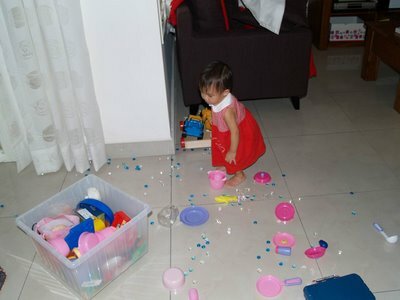 But you have a toy room ler, so at least the mess is controlled. I have to learn that too.. She’s picking up after herself too nowadays, but not 100%. Actually compare to some other kids, she doesn’t have a lot of toys. A lot of toys are inherited from King’s Wife’s kids. But because they are small pieces (those cooking set utencils), they get scattered far away, making a big mess. And she also likes to play with adults’ things.. like the pebbles I bought for my plants.. See.. these things are hard to clean up once they are ‘poured’ out.